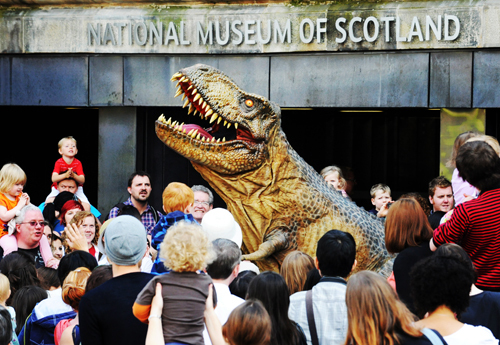 A date with Tyrone the T.rex! 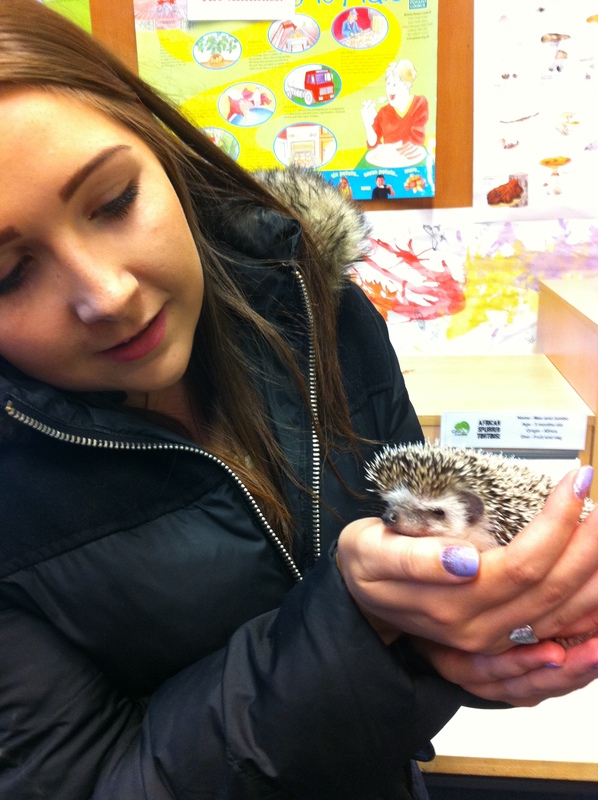 Tyrone will be meeting the visitors at Robot’s Live! at National Museum of Flight. Keep an eye out for him and be careful that he doesn’t sneak up on you because you never can tell when he is feeling hungry. 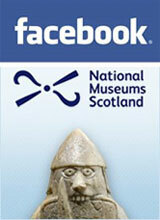 Tyrone is a familiar face at the National Museums Scotland, he made his Museum debut at the re-opening of the National Museum of Scotland in 2011. 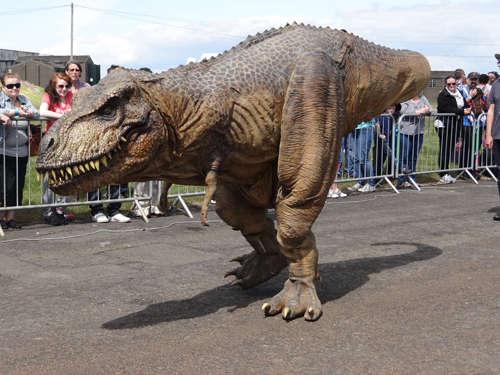 Tyrone the animatronic T.rex gets ready for events by waking early in the morning and doing his stretches. He sings (or roars) in the shower, eats a light breakfast before brushing his teeth. His current favourite thing to eat for breakfast is a giant T-bone steak pie topped with a hearty spoon full of mushy peas dolloped right in the middle of the pastry top. . .he washes this down with a glass of thick gravy followed by a glass of milk. Millennium Live is a company created by multi-award winning film and TV prosthetics house Millennium FX. They produce movie-quality special FX creations make live appearances that are spellbinding and unforgettable. We hire our creatures and characters, build duplicates to order and create brand new characters for our customers. Gearing up for battle at Robots Live! 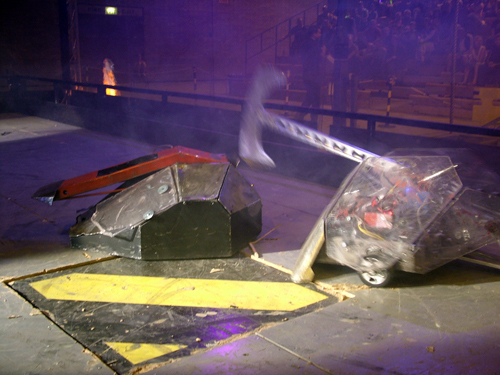 Robots Live will be bringing their battling bots to the second annual Robots Live! event at the National Museum of Flight, East Fortune on Sunday 17 June 2012. It’s a great pleasure we have been invited back to Robots Live! at the National Museum of Flight. We’ll be bringing some of the mechanical monsters from television’s Robot Wars to fight it out live underneath the iconic Concorde. As well as the 100kg Heavyweight robots you’ve seen on the television, we’ll have their smaller relations the Featherweights, weighing in at 13.8kg. We will also have the unique Boxing robots, standing at 1.82metres tall. These machines will stand toe-to-toe in an all out robot boxing match – there only two heavyweight boxing robots in the world. Joining the combat robots will be our resident mechanoid ‘Sidewinder’ and his popular friend the Dalek. You can also have a go at driving a robot on our ‘Cyberball’. Battleaxe robot making an appearance at Robots Live! 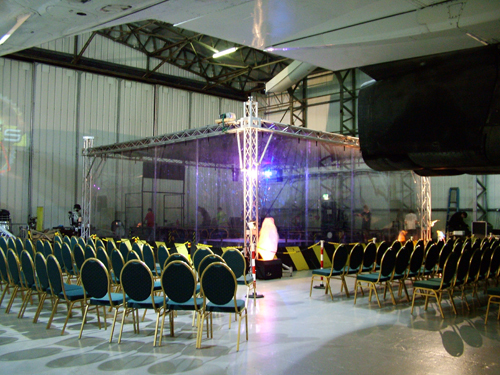 We’ve been running events since 2001, and built our custom fighting arena in 2007. We’ll be bringing along the 8×8 metre arena complete with hydraulic pit. The arena stage is constructed out of steel sections and a 30mm thick wooden floor. Around this is a self-climbing trussing structure that supports the suspended polycarbonate screening: this makes sure no flying shrapnel (or robots!) can leave the arena. Setting the stage for the battle arena. Even though this is only a one day event, preparations begin weeks in advance: all the robots are serviced and any repairs done. As we are based about 300 miles away in the East Midlands, we will load the vehicles on the Friday and start the journey up to Scotland. We usually arrive at the National Museum of Flight around lunchtime, just in time to pop in to the excellent Aviator Café for some food. Once we’re all filled up we start with the set-up. It’s an excellent venue for us as the loading is very easy and we have the amazing Concorde as a backdrop. It normally takes around six hours to set up the arena with a crew of eight. On the day of event we don’t normally get a moment to rest – between each show we’ll be busy fixing robots, charging the batteries, filling the gas bottles and talking to interested visitors. I have several roles during the shows. First, to ‘Tech Check’ all of the robots – this is a safety check on the robots to make sure they comply with the rules and regulations and that they have all of the safety systems fitted and working. Whilst the show is on I will be ‘Arena Marshall’, responsible for the loading of the robots into the arena but more importantly making sure they are armed up safely and at the end of the fight that they are dis-armed safely as well. Should there be any issues during a fight I will be on hand with a fire extinguisher! I will also be operating the sound and lighting, whilst driving some of the robots. For the last two years I have hosted the show as well, but thankfully this year we have our resident presenter, Ed Hoppitt, coming along. He is the Team Captain of Team Storm, who are the current Robot Wars World Champions with their robot Storm 2. Battling robots appearing at Robots Live! National Museum of Flight, East Fortune. We’ll be running 3-4 shows during the day, each lasting around 40 minutes. Each show will be of the same format with two heavyweight fights, a featherweight fight and a boxing match, although each fight will be different, so well worth coming to as many shows as you can! For more information on Robots Live you can visit our website; www.robotslive.co.uk you can also follow us on Facebook and Twitter for exclusive behind the scenes information and pictures; www.facebook.com/robotsliveshow and www.twitter.com/robotslive. Replay Events brought their retro video gaming to the second annual Robots Live! 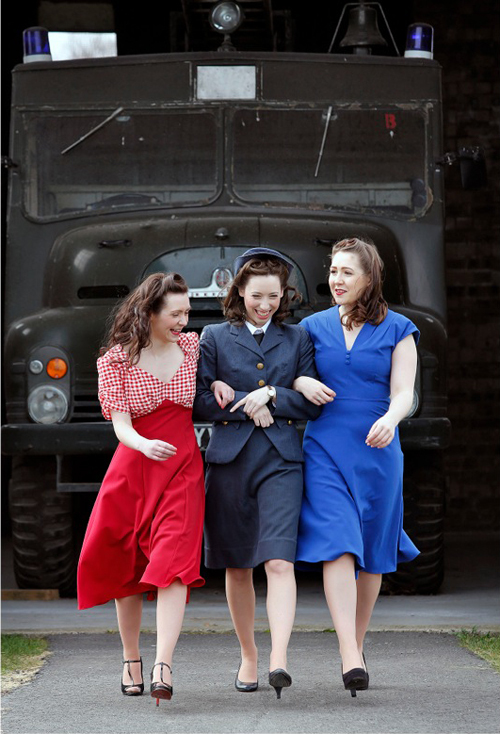 event at the National Museum of Flight, East Fortune on Sunday 17 June 2012. Replay Events are a company who specialise in video gaming events and equipment hire and we will be providing a ‘robots’ themed videogames display for Robots Live! at the National Museum of Flight. 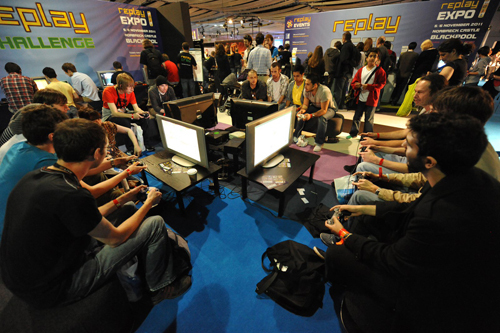 Gamers in the Replay Lounge, which will be at Robots Live! at National Museum of Flight. Running an event, even for just one day, takes a lot of preparation. All equipment has to be thoroughly checked and cleaned, all games have to be tested and spares need to be brought – some of the equipment we are asked to provide is over 30 years old! Depending on the size of the event, setup can take anything from a few hours to a few days and it isn’t unusual for us to work through the night to get things ready for a deadline. Remember these? See them at Robots Live! at National Museum of Flight. For the Robots Live! 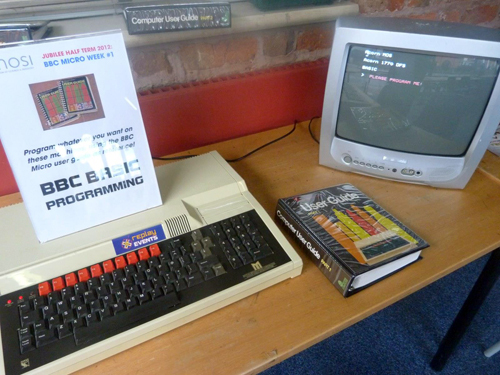 we will be bringing a selection of computers and consoles from the 1970s right through to the most recent consoles. We will be showing how robot games have evolved as the games machines have become more powerful over the years. There should be something for all ages with our display – parents will enjoy showing their children what games were like when they were at school, some of the latest consoles will be on display for avid gamers and the exhibition should evoke a few smiles as well as memories in even the most casual of gamers.